The third season of Deep Space Nine follows a similar tone and storytelling as the second. Opening with The Dominion’s bold introduction – carried over from the second season finale, the season gradually introduces this new threat and confirmation of Odo’s origins. The season witnesses a return to the mirror universe, Bareil’s death, Quark’s Klingon marriage, and Odo’s first confessed love of Kira. The arrival of The Defiant presents new opportunities off the station, and Season 3 sees major developments for Garak, including confirmation of his ominous pre-tailor life. Aboard the newly acquired U.S.S. Defiant, Sisko and crew sets out to find the Founders in the Gamma Quadrant. While Odo and Kira learn more about The Founders, Sisko and crew are concerned about sweeping changes back home. After accidently killing a Klingon warrior, Quark is forced to marry his widowed wife. Meanwhile, Miles tries to cheer up a depressed Keiko. Jadzia discovers a secret Dax symbiont with a violent past. Kidnapped and surgically altered, Kira is lead to believe that she is the long-lost daughter of a prominent Cardassian figure. Odo mentors a rapid-aging Jem’Hadar baby who was found in salvaged wreckage bought by Quark. Miles unknowingly triggers a Cardassian security defense program, designed to prevent a Bajoran uprising. The Defiant discovers a planet that phases in and out of this universe every sixty years. With the help of a familiar face, The Maquis steals The Defiant. While DS9 hosts the Bajoran Gratitude Festival, the station’s personnel begin exhibiting unusual behavior. Sisko, Dax, and Bashir suddenly find themselves in the midst of a contraversial social clash on Earth in 2024. Sisko, Bashir, and Dax are caught in the middle of the violent Bell Riots of 2024. Vedek Bareil’s life hangs in the balance while an ambitious Kai Winn negotiates a peace treaty with the Cardassians. Meanwhile, Jake and Nog face a culture clash. Odo’s hidden feelings for Kira surface when her life is jeopardized from growing crystal engulfing her body. A Bajoran spiritual leader cautions the arrival of two Cardassian scientists. Quark and Rom are concerned about Grand Nagus Zek’s peculiar behavior that goes against the very foundation of Ferengi society. Upon seeing visions of his future self, Miles must prevent the station’s inevitable destruction. An assault leaves Bashir’s mind to slowly deteriorate, leaving to vivid fantasies. Sisko is forced to persuade the alternative-universe version of his wife to join the Terran Rebels to save her life. 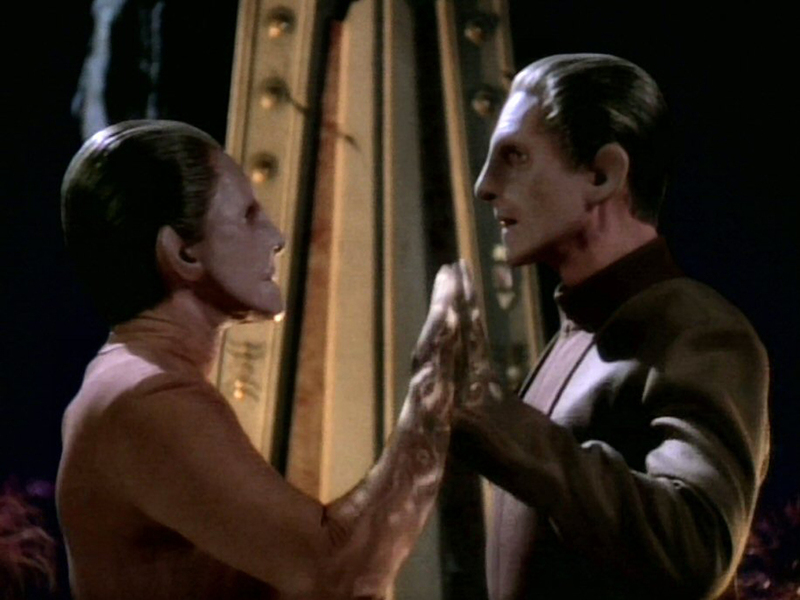 Odo’s investigation into who tried to kill Garak leads to his uncovering a shocking Romulan/Cardassian alliance. After building a historic Bajoral sailing ship by hand, Sisko takes Jake on a trip to study the likelihood of a long-held belief. Kira is sent to negotiate with Shakaar, the leader of her former resistance cell, who refuses to surrender borrowed farm equipment. Jadzia meets the previous Dax hosts through the Trill zhian'tara ceremony, while Nog tries to enter Starfleet Academy. While on patrol, a Dominion spy is discovered to be aboard The Defiant.